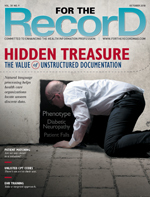 From hurricanes to hackers, forces of all kinds can disrupt medical record service. In this article, Ron Moser, CISA, CRISC, CCSFP, senior site reviewer and practitioner for EHNAC provides insights on how organizations can and should develop solid risk management plans for these exact scenarios. To read the full article, visit For the Record.